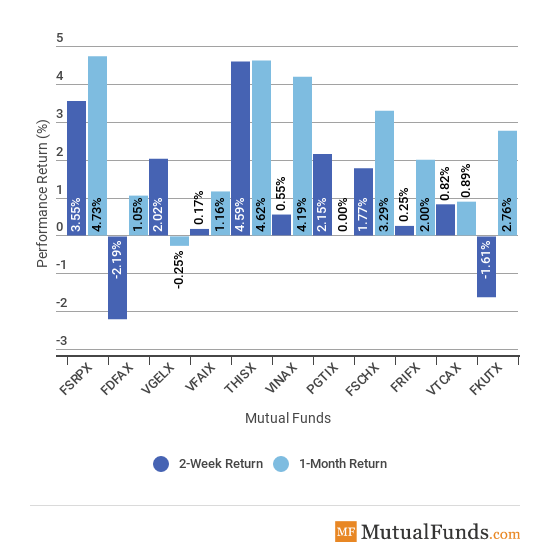 Investors have been taking money out of equity and hybrid mutual funds and plowing them into bond funds. While equity funds had estimated outflows of $3.44 billion for the week ended August 22, bond funds saw inflows of $1.64 billion. A large part of the inflows went into taxable bonds – $1.23 billion. Municipal bonds had estimated inflows of $417 million. The flow picture has not changed dramatically compared to the previous week, when bonds saw inflows of $1.87 billion and equity funds had outflows of $2.26 billion. 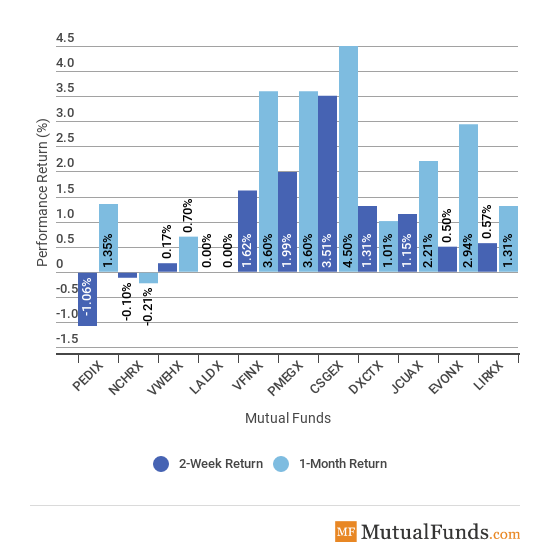 Money has been flowing out of equity and hybrid mutual funds into bond funds for at least the past eight weeks. Taxable bonds and government bonds were the most liked categories, receiving most inflows over the past two months. Federal Reserve Chair Jerome Powell has indicated that the current path of interest rate hikes is the right approach amid rising voices that the U.S. central bank is behind the curve and may be caught wrong-footed. Were the inflation to spiral out of control, Powell said the Fed would do “whatever it takes” to head it off. U.S. President Donald Trump is ready to launch another round of tariffs on Chinese goods as soon as a period for public comments on the initiative ends. Currently, around $50 billion of China’s imports are subject to levies. The U.S. government may target another $200 billion, raising the stakes in a trade dispute that threatens to derail global economic growth. Over the past 2 weeks, broad indices saw mixed performance. Technology-heavy Nasdaq-100 Index Fund Direct Shares (NASDX) soared 3.58% over the last two weeks, within a whisker of becoming the top monthly performer. Vanguard Total Bond Market (VBMFX), which has mortgage-backed government securities and U.S. Treasuries among its top holdings, was the poorest performer over the last two weeks, dropping by 0.29%. For the rolling month, Vanguard 500 Index Fund (VFINX), which tracks the performance of the S&P 500, was the best performer, up 3.60%. 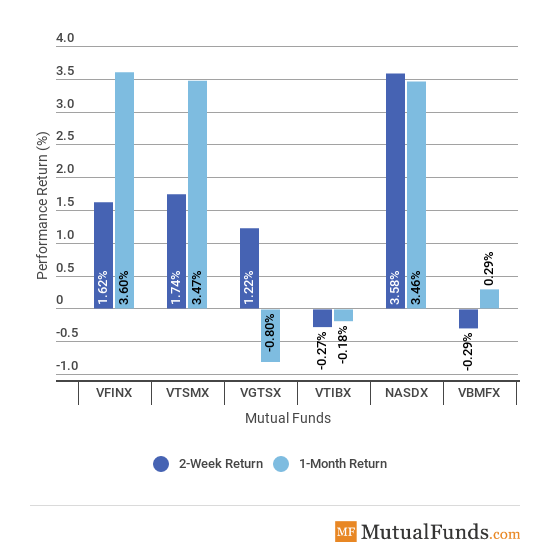 Vanguard Total International Stock (VGTSX), a global index except U.S. equities, is the worst monthly performer, reflecting an increasing rift between the economic performance of the U.S. and the rest of the world. The healthcare sector (THISX – T. Rowe Price Health Sciences Fund I Class) posted the best performance over the last two weeks, edging up 4.59%. At the other end of the spectrum is consumer staples (FDFAX), which fell 2.19%, as the overall industry has been struggling under pressure from nimbler online competitors. For the rolling month, the retail sector (FSRPX) is the best performer with an advance of 4.73%, as giant retailers such as Walmart and Target posted better-than-expected results, with the U.S. consumer in good shape. Amid a spate of global threats, Japanese equities (HJPNX) were favored by investors, with the Hennessy Japan Fund rising 2.50% over the last two weeks. India (WIINX) along with Latin America (RLAIX – T. Rowe Price Latin America Fund I Class) were the only fallers over the last two weeks. WIINX was down by 0.66%, while RLAIX was down by 2.25%. 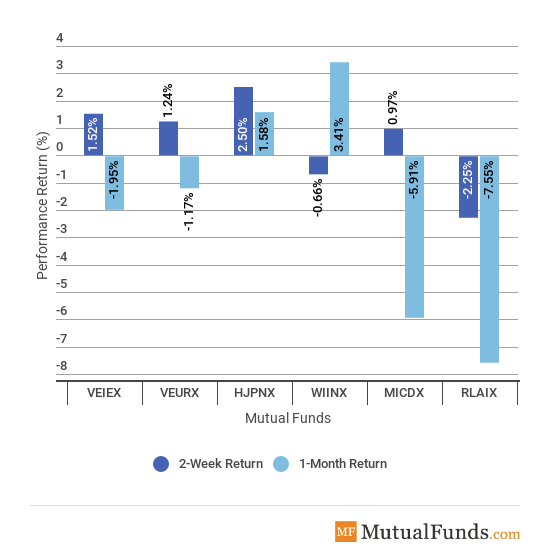 RLAIX, unsurprisingly, is the worst performer for the rolling month with a decline of 7.55%. The continent’s equities have been plagued by the currency crisis in Argentina, a potential arrival of populists in Brazil and ongoing drama in Venezuela. However, Indian equities remain the best monthly performers, up 3.41%, as the country seeks to offer stability amid rising worries in emerging markets stemmed from the U.S.-China trade war and the Turkey crisis. BlackRock’s small-cap index (CSGEX) is up more than 3.5% over the last two weeks, as the U.S. economy appears to be in great shape, with the output rising by more than 4% and the consumer sentiment hovering near record highs. CSGEX is also the best performer for the rolling month, up 4.5%. PIMCO Extended Duration Fund Institutional Class (PEDIX), a long-term bonds index, is down 1.06% over the last couple of weeks, representing the worst performance. For the rolling month, high-yield municipal bonds, Nuveen California High Yield Municipal Bond (NCHRX), recorded the weakest performance, down 0.21%. In the U.S., technology and small-cap stocks were the most favored equities lately, thanks to a strong economy and growth prospects. At the same time, the U.S. and Japan provided relative safety to investors, as other regions, such as emerging markets and Europe, have been suffering from increasing trade tensions.